Nestled in the folds of several dramatic mountains, Jim Thorpe is one of America 's most scenic and historic towns and is called "America's Little Switzerland". The Inn at Jim Thorpe is one of the small and walkable town's landmark treasures. Built in 1849 and listed on the National Register of Historic Places, the Inn combines old world charm with modern conveniences. Best of all, the town's quaint shops, antique stores, galleries, opera house, pubs, restaurants, train rides, river rafting, kayaking, and hiking/biking trails are just steps from the front door. Remember, you don't have to go far, to feel far away. Built In The 1840's, this hotel was painstakingly and recently renovated to preserve the essence of that high-flying era of gaslights, horse-drawn carriages, and Victorian opulence. It is said General Grant, President Taft, Buffalo Bill, Thomas Edison, and John D. Rockerfeller have each stayed here. The village offers a wide variety of nearby activities such as boating, bicycle rentals, fishing, children's playground, golf, cross country skiing, sailing, horseback riding, galleries, hiking trails, jogging track, mountain biking, train rides, snow mobiling, swimming, water skiing, & snow skiing. The Swiss Tourist Board has dubbed Jim Thorpe "America's Little Switzerland." General Information: Rooms range from $90-$279. Standard rooms: $89 Deluxe rooms: $119 Suites: $169 - $279 Additional person in room $12.00 Get rates and room descriptions when checking availability. 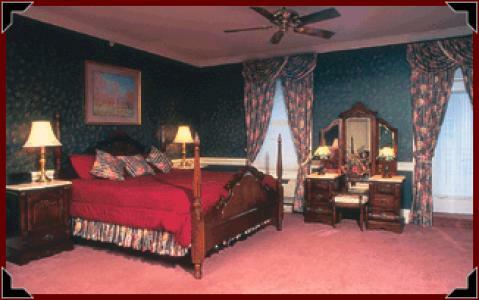 Nice Suites and rooms all with private baths some with fireplaces, whirlpool, refrigerator, and microwave. This Inn style hotel is most suitable for couples. Inn Features - access to balcony, Complimentary deluxe Continental breakfast, Complimentary outdoor parking with limited handicap access, snack shop, video library, cocktail lounge, air conditioning, computer hookups, individual climate control, nonsmoking rooms, premium channels, laundry/valet, luggage hold, maid service, tour desk, room service, computer hookup & fax service. Some services available for a fee. RATED 3 DIAMONDS BY AAA.